To catch up on the Part I recording, CLICK HERE. 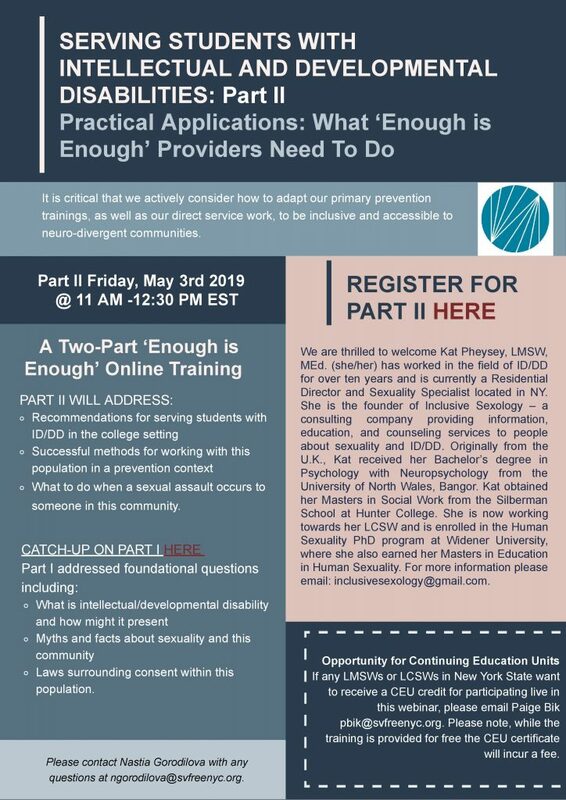 This two-part training series is presented by your Center for Training and Technical Assistance: the NYC Alliance Against Sexual Assault and the NYS Coalition Against Sexual Assault, in collaboration with the NYS Department of Health. If any Licensed Master Social Workers (LMSWs) or Licensed Clinical Social Workers (LCSWs) in New York State want to receive 1 Continuing Education Unit (CEU) credit for participating live in Part II, please email – pbik@svfreenyc.org. Please note that while the training is provided for free, the CEU certificate is an additional opportunity that is not covered under any DOH grants so will incur a fee.